Anyone involved in a subscription-based business knows failed credit card transactions happen. But, there is a window of opportunity between when the failed transaction occurs and when your company cancels the account for non-payment. During that window, it’s mission critical to communicate with your customers in order to recover revenue. That lovely window is where your revenue retention strategies live, and today we’re sharing a number of ways you can improve those strategies and maximize recovered revenue. Throughout this post, you’ll notice we use both “revenue retention” and “dunning” to discuss revenue retention strategies. In general, revenue retention strategies are the methods you use to reduce customer churn caused by failed or delinquent payments (though, we’ll also discuss how you can proactively reach out before there is an issue). Dunning is the process of communicating with at-risk customers to bring their accounts current after a failed payment attempt. Deciding how to handle past due accounts after a certain amount of failed attempts, emails, days, etc. The chart above looks at the results of a 2016 survey of over 400 SaaS companies by SaaS Capital. 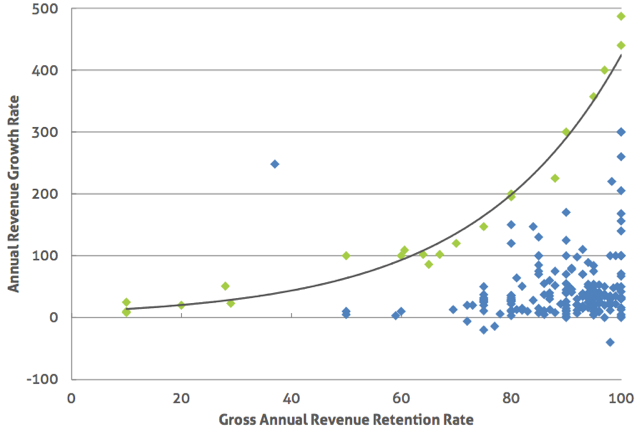 What you see is growth rates plotted against gross revenue retention rates. The positive impact a revenue retention lift has on a subscription business’ bottom line isn’t limited to SaaS companies. With an optimized dunning strategy, we’ve had Chargify merchants retain as much as 89% (B2B) and 73% (B2C) of their at-risk accounts! Note: Throughout the post we focus on emails as the main form of dunning communications. Emails are the preferred communication method because they can be automated and the process is more scalable. However, if your company is utilizing phone, push notifications, in-app messaging, or other communication methods, all of the points below are still applicable to help you improve your revenue retention strategies. As we mentioned in the previous section, dunning is the process of communicating with customers following a failed payment transaction, in an attempt to bring the past due customer’s delinquent account current. Up to 50% of lost customers are due to expired cards and failed transactions. Why wait until there is an issue? You can proactively send communications to subscribers whose credit card on file has an upcoming expiration date. Consider emailing the subscriber prior to the credit card expiration to alert them of the upcoming expiration and prompt them to update their credit card information. Once the card is expired the chances of getting them back is much worse than getting them to update the card ahead of time. It’s a big psychological difference… once they aren’t a customer anymore they have to make the decision to once again become a customer rather than just updating some information. Some payment gateways have automatic card updaters, which automatically update the credit card information without your customer having to do anything. If your payment gateway provides this feature, you’ll want to make sure it is enabled. Customize your revenue retention communications. Branding issues are a common issue with businesses’ dunning emails. Is it easy for your customers to tell the revenue retention emails are coming from your company? If the answer is no, you have a problem with your revenue retention strategy. Where there is a problem, there is room for improvement. If you have access to dunning email templates, those are a great place to start. But, don’t stop there. You should customize with your own logo, company colors, and branding to ensure subscribers understand the emails are coming from your company. Make your dunning communications personal. In our blog post The 9 Elements of a Successful Welcome Email, we discussed how personalization is an important part of a successful welcome email. 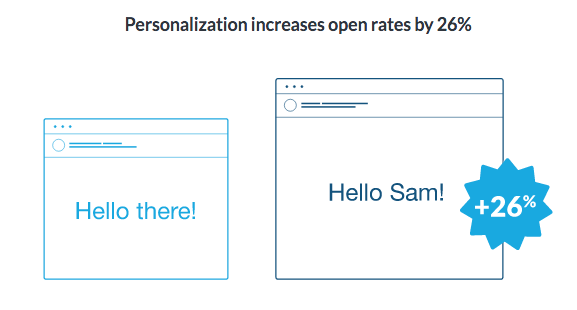 Personalization is also key for your revenue retention strategy emails. While a failed transaction has occurred, the email recipient has been a paying customer. To not address them by name in your communications is insulting. Additionally, your dunning emails should never come from a “no-reply” email address! You’re attempting to get them to take an action and recover the revenue — make replying to the email address and communicating with you as easy as possible. Relay a sense of urgency. 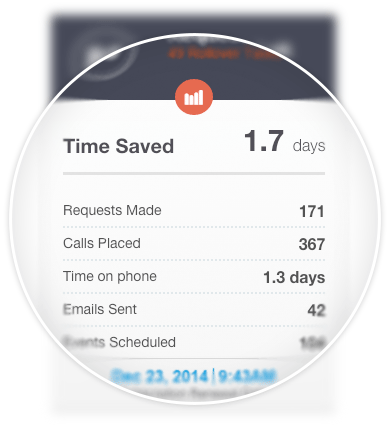 Does your email convey a sense of urgency that the customer will be compelled to respond to immediately? Whether your company is B2B or B2C, you know your customers most likely have incredibly long to-do lists to get through everyday. Most of us do. So, you need to relay a sense of urgency via your dunning communications. Even adding words like “urgent” and “final notice” to a subject line helps communicate the pressing nature to your customer. Note: this doesn’t mean your communications need to take the tone of a debt collector. Remind the customer of the value you provide. “Every time I log in to my account, I see a clear picture of the value I’ve gotten. Seeing numbers like that makes me appreciate their service that much more, and makes me a lot more likely to keep doing business with them,” writes Markidan. You revenue retention emails can also communicate recent feature releases or product updates so your customer understands the additional value they’ll be missing out on if they don’t update their credit card information quickly. Make sure your revenue retention communications have a crystal clear CTA for your subscriber. While this seems obvious, customer success leaders say it isn’t unusual for this to be an issue when they’re reviewing dunning communications. What is it that you want the customer to do? Make sure the “next steps” are very clear and as easy-to-follow as possible. For instance, if the goal of the dunning communication is to get your customer to update their credit card information in their account, include a link in the email so that updating that information is only a click away. Assume your email will be read on a mobile device. Under that assumption, both the email and landing page your email links to should be responsive and easy-to-view on a mobile device. Determine how aggressive your revenue retention strategy needs to be. This one is probably the least self-explanatory. When talking about revenue retention strategies, “how aggressive you should be” primarily refers to how frequently you should retry the credit card and send emails. Above is a screenshot of preconfigured dunning strategies made available to Chargify merchants. The strategies are based on years of experience and helping subscription businesses maximize recovered revenue, and are successfully implemented by many of our merchants. These aren’t absolutes, but solid baselines to get started with. Based on your own revenue retention analytics, you’ll be able to experiment with and determine the best retry and communication schedule to maximize recovered revenue for your own business. Optimize for the best timing. 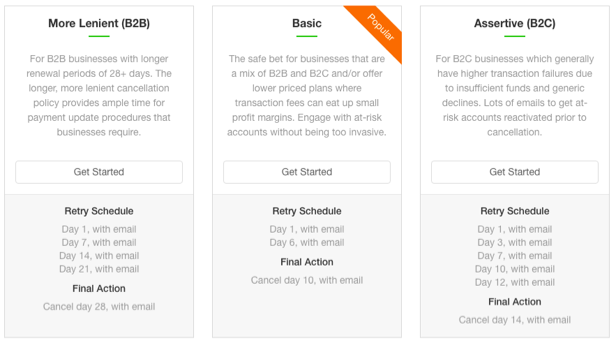 We already discussed proactive timing and how your business type can help guide your revenue retention strategy schedule (as seen in the examples above). If you look back at the examples above, you’ll see that none of the strategies send out dunning communications multiple days in a row. “Sending out dunning notifications back-to-back can convey a sense of spam,” explains Kayla Van Baak, Customer Success Manager at Chargify. Van Baak also points out you don’t have to send an email every time you retry the customer’s card. Ideally, you want consistent graphical data when you’re reviewing your revenue retention analytics. “There should always be an element of consistency in your revenue recovery,” says Van Baak. Identify when you’re maximizing revenue recovery. When reviewing your retention analytics, pay attention to the time frame during which most of your revenue is recovered. In the example above, the majority of the merchant’s revenue is recovered during the first 3 days of their dunning strategy (their strategy ends at Day 14, so there is zero recovered revenue after that point on the report). With that in mind, the merchant may want to experiment with a more aggressive revenue retention strategy during the first few days and less aggressive later on. Use churn codes to help identify why revenue isn’t recovered. On the back end of your subscription management system, the cancellation reason generates a churn reason code. Then, you can easily run a report to look for patterns in cancellations. 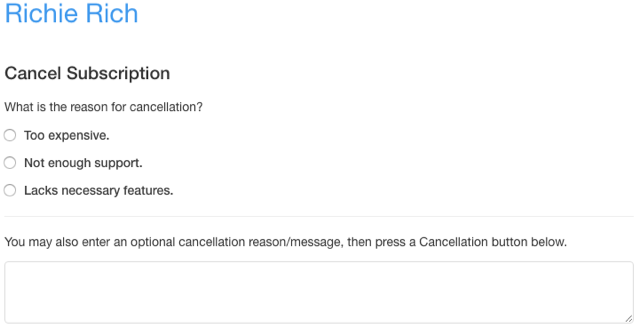 Understanding cancellation reasons can help you improve your product and give you insights into product value you can be reminding customers of in your dunning emails. 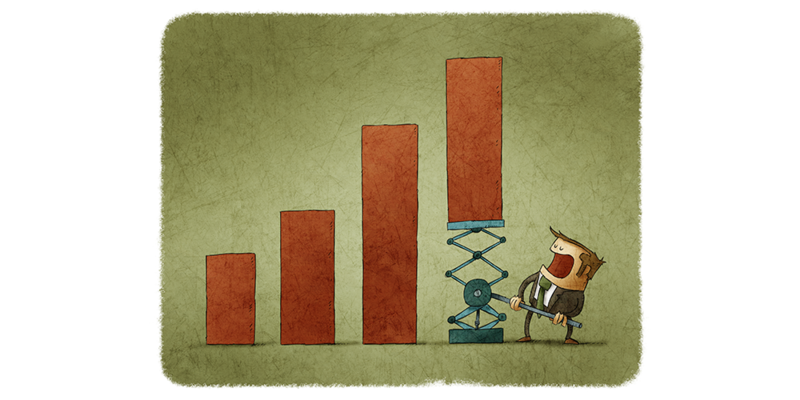 What does an effective revenue retention strategy look like? Obviously, the answer depends on many factors and is specific to your own business. In general, though, when viewing your analytics, take a look at the amount of revenue which was lost and the amount of revenue recovered for any given period. Using the same example from before, this merchant lost $336 in revenue and recovered $408 in August 2016. As a very general ballpark, you want your recovered revenue to be approximately twice the amount of your lost revenue. With that in mind, if the merchant had $336 lost revenue they would want to see $672 or more in recovered revenue for the same time period. Obviously, you want your recovered revenue to be as high as possible and your lost revenue amount as low as possible. It is mission critical that you have visibility into your revenue retention analytics. You need those insights to see how effective your current dunning strategies are and to help you determine how to fine-tune your revenue retention strategies further. As information packed as this post is, it won’t be helpful if you don’t have a clear view into your revenue retention analytics. While failed transactions and churn aren’t the goal of any subscription business, they will happen. But, you aren’t at the mercy of them. Using insights from your own revenue retention analytics and the the tips in this post, you can make your revenue retention strategies even stronger. Continually improving your revenue retention strategies helps ensure you maximize your recovered revenue. You can start incorporating all of the tips in this post today! Let us know how it goes — share how you improved your revenue retention strategy in the comments below. Last, but certainly not least: A huge “thank you!” to Chargify Customer Success Manager Kayla Van Baak for all her assistance with this blog post!